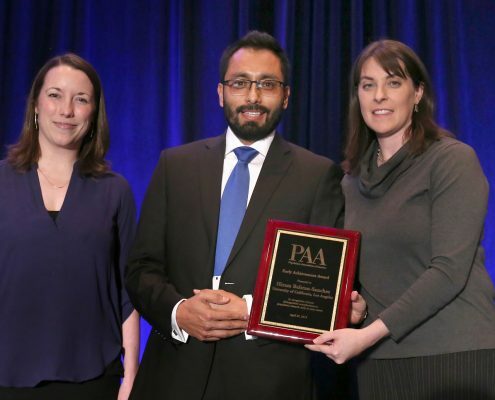 Assistant Professor Hiram Beltran-Sanchez, of the UCLA Division of Social Sciences’ California Center for Population Research (CCPR) and Department of Community Health Sciences, was recently awarded the Early Achievement Award from the Population Association of America (PAA) at the 2018 Awards Ceremony and Presidential Address Session. The PAA Early Achievement Award recognizes distinguished contributions to population research during the first ten years after receipt of the Ph.D. Contributions may be original research published as articles or books, significant newly collected data, or public policy achievement that broadens the impact of demography. The award citation commended Dr. Beltran-Sanchez’s original contributions in all three areas: his innovative development of theory and rigorous research, his leadership in creating the Latin American Mortality Database, and the direct relevance of his research for public policy. More specifically, Dr. Beltran-Sanchez’s research addresses major themes at CCPR, including the health of immigrants, the effects of early life experiences on health in late life, and health and aging in Mexico, and the development and application of demographic methods to investigate health inequalities using macro and micro data. This year he has been involved in CCPR’s informal working group on demography and big data, in addition to teaching in the graduate demography program and serving on several major CCPR committees.